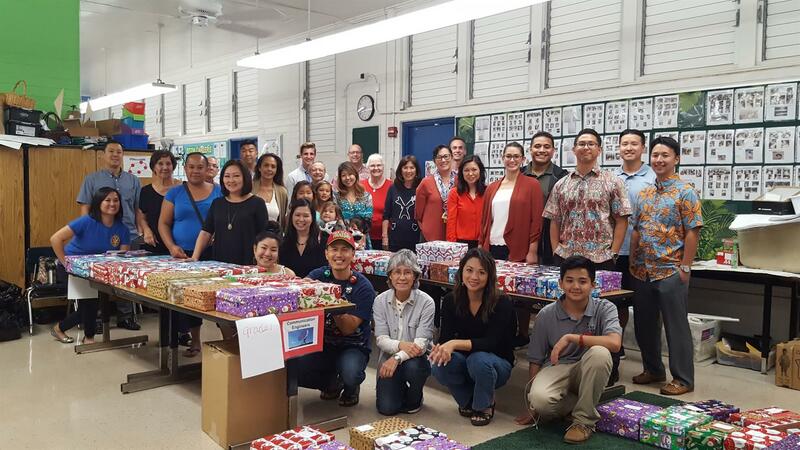 The Rotary Club of East Honolulu continued a sweet and impactful tradition of presenting each student at Palolo elementary school with a wrapped Christmas shoebox filled to the brim with snacks, games, school supplies, and a logo water bottle. About 50 rotarians, rotaractors, employees from AXA Financial, and family & friends picked up, wrapped, stuffed, and presented about 300 shoeboxes to students at their Christmas program. Members of Rotary Clubs of Lahaina Sunrise, Lahaina and Lahaina Sunset gather to install the first of several rescue tube stations at Launiupoko Beach Park on Thursday morning. Those with experience in driving the plastic pole into the ground and attaching the flotation device, including Tori Taylor (left) and David Ristau (in foreground), demonstrated the steps before the group broke up into smaller teams. 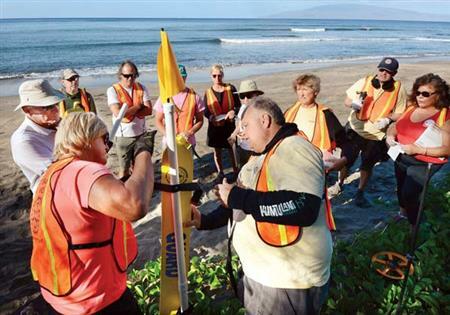 Rotary Club of Lahaina Sunset past president Mariko Higashi said the clubs planned to install 22 rescue tubes this week at Maui County beach parks from Papalaua to Kamehameha Iki. She said the tubes cost $175 apiece, and the clubs still are raising funds to purchase tubes for the rest of West Maui’s beach parks. “Our plan is to go all the way to D.T. Fleming,” Higashi said. “We welcome donors and volunteers to monitor and maintain the tubes.” She said those interested may call her at (808) 866-8116. 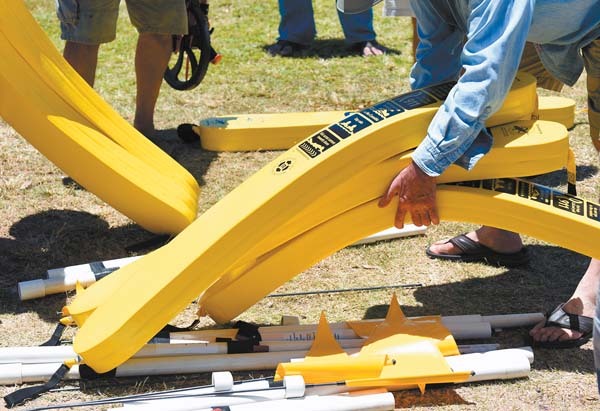 The first rescue tube stations in the state were installed on Kauai 10 years ago. 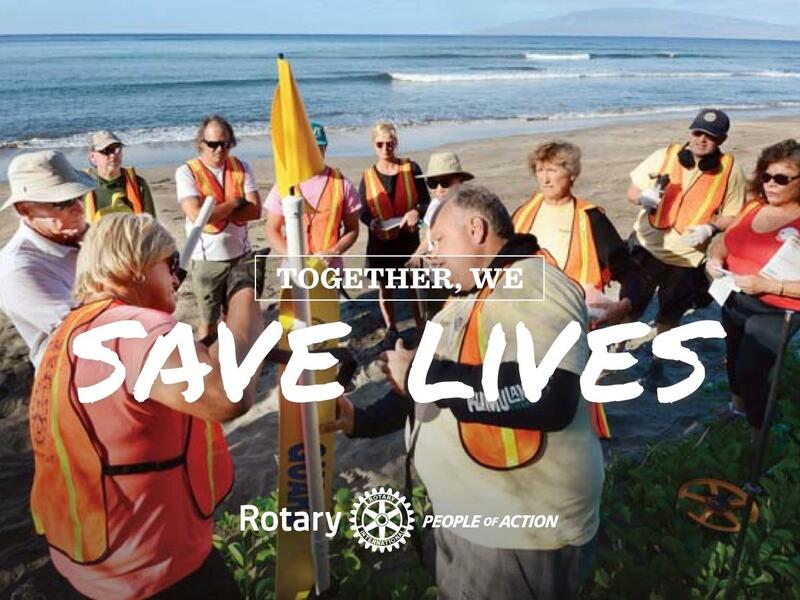 Rotary Club of Kihei-Wailea brought the concept to Maui in 2017, installing tubes along South Maui beaches. 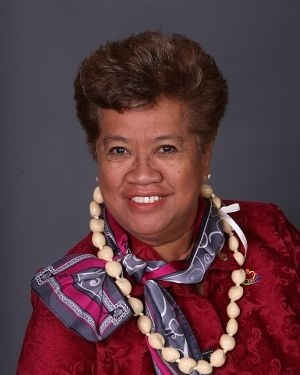 Ho'ola Na Pua helped organize the Human and Trafficking Awareness Day Walk and Fair. The Rotary E Club of Hawaii walked with DG Win and many other organizations and members of our community in Downtown Honolulu. Please join us and bring awareness to human trafficking and learn about how we can take a stand against human trafficking on our islands. The three clubs — the Rotary Club of Lahaina Sunrise, the Rotary Club of Lahaina and the Rotary Club of Lahaina Sunset — have 22 tubes that they plan to install in late February, said Mariko Higashi, who was the president of the Rotary Club of Lahaina Sunset last year and has been spearheading the project. Higashi said the tubes cost about $3,000 in total and were paid for by the clubs as well as the Hawaii district office that oversees all Rotary clubs. Watch a Hawaii News Now Special Report about this project! 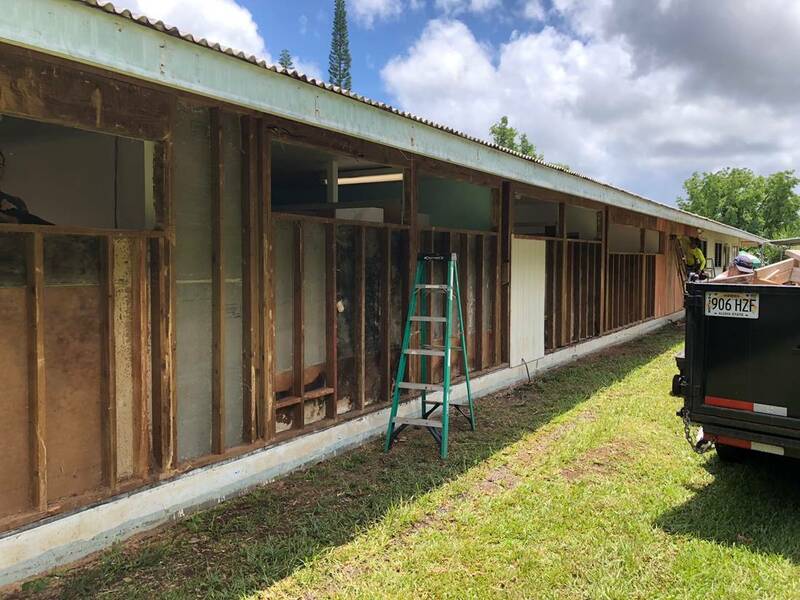 Rotarians, families, friends, students, and contractors gathered this past weekend to restore a building at Nani Mau Gardens for students to continue with their education. The Kua O Kala Charter School was destroyed by the lava flows in lower Puna. This building at Nani Mau needed very serious restorative work because of the extensive termite damage over the years, a joint club project was coordinated by the Rotary Club of Pahoa Sunset to get the job done! The Rotary Club of Hilo accepted $20,000 US dollars from their "sister club", Rotary Club of Hiroshima South at their meeting on Friday, June 1. Their contribution will go toward the Puna Relief Fund with the funds distributed by the Rotary Club of Pahoa Sunset. 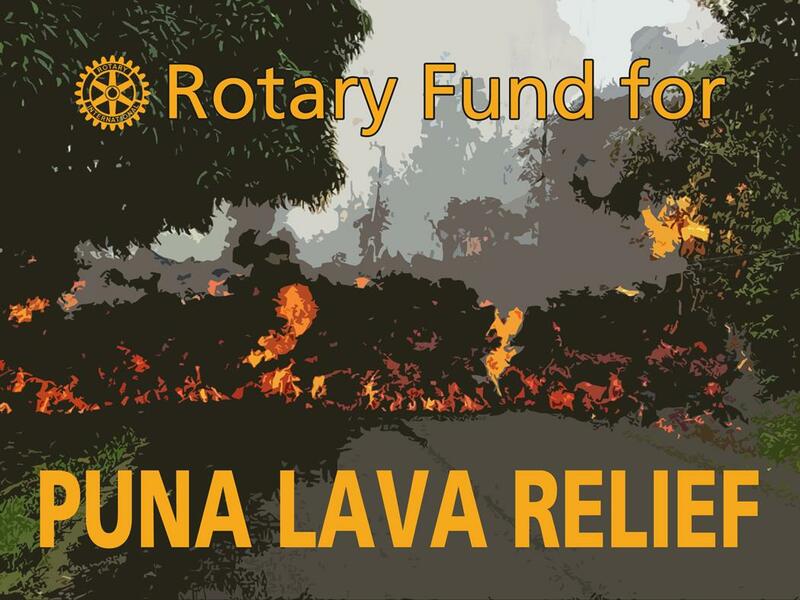 The Rotary d5000 Foundation (a 501 (c)(3) organization) is now accepting donations by credit card on the DONATE link below or checks can be mailed directly to the Foundation at 45-675 Luluku Road, Kaneohe, Hawaii, 96744. Please put "Puna Relief Fund" on the memo line. Happy May Day to you and hope you are wearing that special lei that binds us as a community and that wreath of love. Speaking of love, I’d like to thank those who have donated to the Disaster Fund through our District website; and if you haven’t made your donation, please kokua your neighbor on the island of Kauai. They are still struggling with the aftermath of mud and debris caused by the heavy rain. Show that aloha to those around you. Speaking about Aloha, in 17 days we will be celebrating all the accomplishments our clubs have completed throughout the year at the beautiful five-star Four Seasons Resort at Koʻolina. And being that May is Youth Service Month, we are reaching out to Rotaractors and Interactors to attend Saturday’s plenary session for the cost of lunch at $65.00. It’s surprising how many future leaders of tomorrow don’t know who we are nor what we do. We want to close that gap in Hawaiʻi. We’d love to see you consider sponsoring a student or your family member. Your conference planning committee is working extremely hard to create an exciting conference for you! In closing, I would like to quote from RI President Ian Riseley’s remarks in The Rotarian magazine that’s worth repeating. “Last June, your Rotary International Board of Directors voted to adopt a new vision statement, reflecting our identity and the single purpose that unites the diversity of our work. lasting change across the globe, in our communities, and in ourselves. I want introduce one of my speakers at the District Conference. His name is Mitty Chang. A Professional Motivational and Inspirational Speaker Specializing in How to Attract Millennials into Organizations. Mitty has delivered speeches to audiences in Canada, Thailand, Portugal, Brazil, Australia, and throughout the USA. He is one of the most sought after young speakers in the Rotary world. He is the Creative Director of Candeavor, a digital marketing & web design agency based in the Silicon Valley. I built my first website in 1998. I was in the fourth grade at that time. By the time I was 13 years of age, I had already begun my freelance web design career. In my early high school years, I began my first part-time business--opening a web hosting business, which continues to run today. Over the past 16 years, I have designed powerful websites for a wide array of clientele.” Mitty Chang will be speaking at our District Conference on Saturday morning May 19th and loves talking to Rotarians, especially young millennials. Sign up for the District Conference on www.rotaryd5000.org. You will be glad you did! Spring is in the air and the flowers are starting to bloom here in San Jose, California which is where I am and where the President Elects Training will start on Friday. It is March and we have four more fabulous months in this Rotary year to do good in the world. 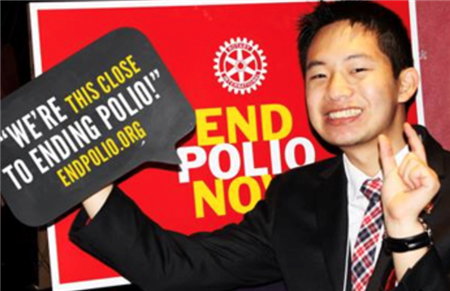 Thereʻs still time to meet your goals for Membership, Polio Plus, and Annual Giving to The Rotary Foundation. Meeting your goals will offer others the opportunity to join 1.2 million fellow Rotarians around the world save lives and fund future global/district grants. More hands, less work. 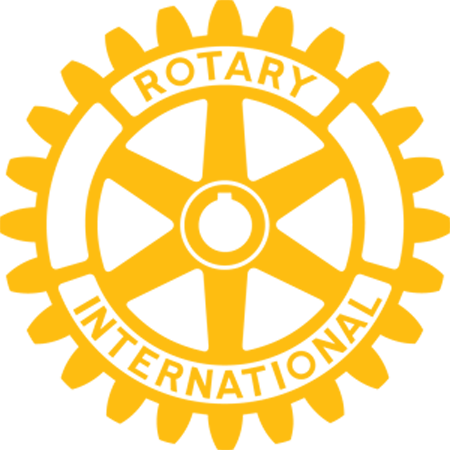 Speaking of work, we need your help with the Rotary International Convention that will be held in Honolulu in 2020. 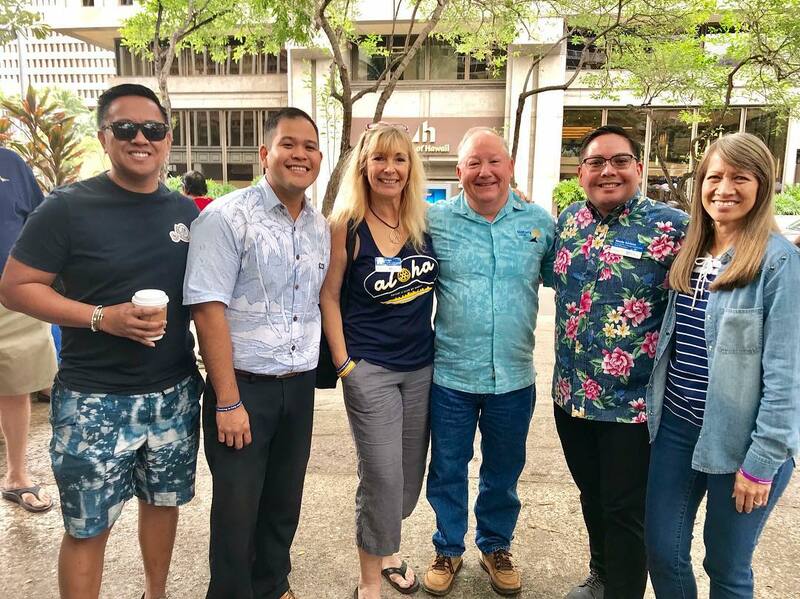 Last week RI President Nominee Mark Maloney and his entourage were here reviewing the venue and activities Hawaii would be hosting for his International Convention. Our Host Organization Committee (HOC) has been busy putting plans together and we need your assistance through financial sponsorships, volunteers, club hosting, entertainers and your expertise. Please give your support as we will need everyone on board. Our District conference is happening May 18th – 20th at the breathtaking 5-Star Four Seasons Hotel on Oahu. Register now on the District website! Come and represent your club and support your president. Let them know you appreciate the time, talent and resources they have given to lead your club this year. 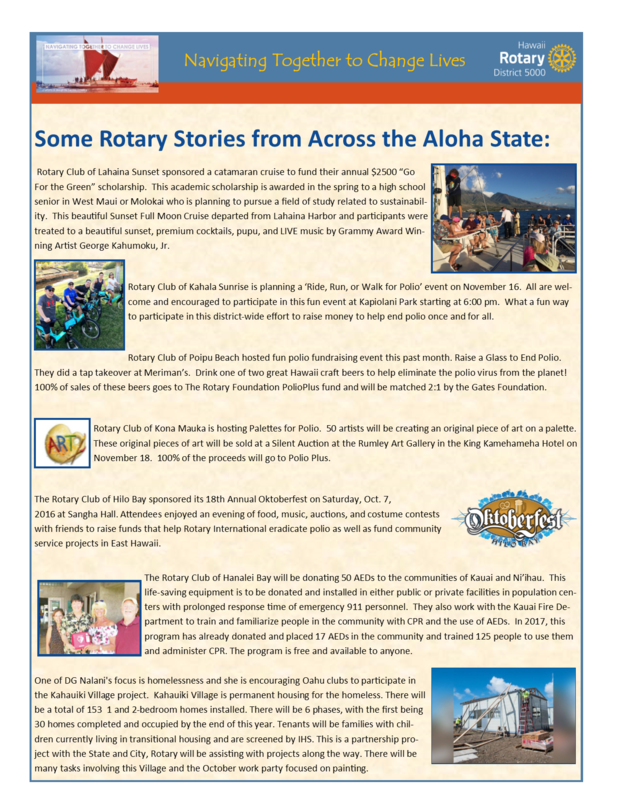 Additionally, Steve Dyer, District Alumni Chair from the Rotary Club of Pearl Harbor, is reaching out to all Rotary Alumni to meet on March 14th at the Pagoda Restaurant in Honolulu for dinner at 6pm. We need your assistance getting up-to-date email information and to get the word out. If you know an alumni, please contact Stephen.dyer@hawadvocate.com In case you are wondering, an alum is someone who has participated in any of the following programs: Interact, Rotaract, Youth Exchange, New Generations Service Exchange, Rotary Youth Leadership Awards(RYLA), Rotary Peace Fellowships, Rotary Scholarships (funded by global grants or district grants), vocational training teams (members and leaders), Ambassadorial Scholarships, Grants for University Teachers, Group Study Exchange (members and leaders), and Rotary Volunteers. What a great way to keep these young people engaged with Rotary! Did you know that March 8th is International Women’s Day? We will be celebrating the 30th anniversary of women in Rotary with an Afternoon Tea throughout our islands, honoring women who are “Making A Difference.” Check our district website or ask your Assistant Governor for information. As a closing thought, we are fortunate in Hawaiʻi to have clean water in our homes when many in the world do not. To quote from the RI website “Clean water and sanitation is a human right. When people, especially children, have access to clean water, sanitation, and hygiene, they lead healthier and more successful lives.” Thank you Rotarians for your contributions to provide clean water worldwide. I trust you had an awesome holiday celebration with family and friends and you are now ready to get back to work with the remaining months of “Navigating to Change Lives.” I want to mention a few things that are noteworthy and the first is about our District Membership standing in the zone ending November 2017. Per our Regional Membership Development Manager Nicole Jones, “District 5000 has experienced the highest net growth so far with a 3.33% net growth” which reflects an increase of 57 new members. However, we do know retention of members in December and June tend to drop as clubs are reviewing members that have stopped coming. May I suggest finding ways to re-engage those who are thinking of leaving through projects, friendship, personal contact and restructuring club dues for financial support. Reach out to them and ask if there is anything you can do. Maybe that is all they need, someone who cares. I would like to give my heartfelt aloha and mahalo to those who participated in the “Ride So They Can Walk” Polio Plus fundraiser by riding their bikes to help raise awareness of this crippling disease AND those who chose to be creative in doing other fundraisers around the state. I thank you and ask that you continue the fight to meet our District goal of raising $300K. I believe we can do it! 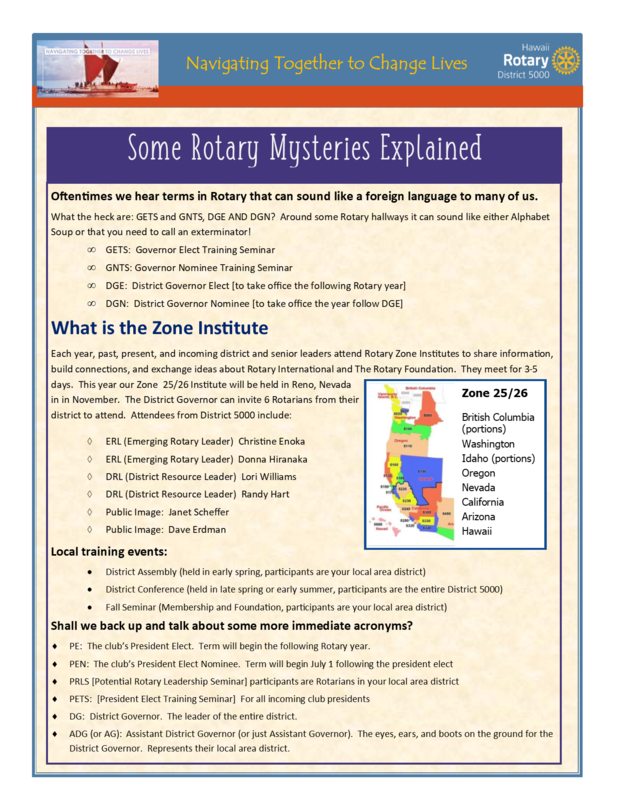 As you read our January Newsletter, you will find stories of fellow Rotarians sharing their vocational skills around our state. Use this month to promote Vocational Service to friends and family by inviting them to join our organization. The Kahauiki Village Transitional Housing project that Rotary partnered with the City & State is a good example of volunteers and businesses coming together for the one purpose of “service above self” and providing families who are working but can’t afford the housing market, a “second chance”. To the countless clubs, Rotarians, family and friends, I thank you for supplying the units with household items, for painting, cleaning and giving of your time each week. The families moved in last month and you are part of that success story. 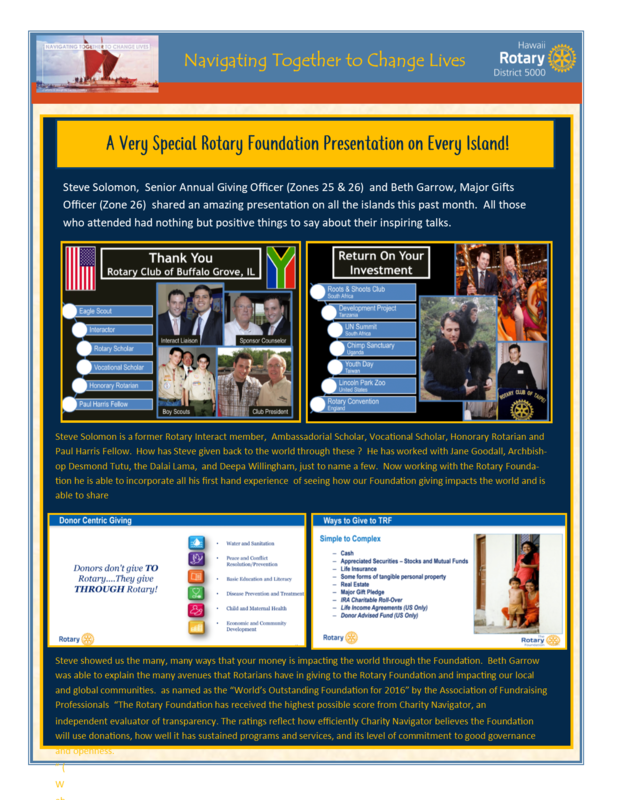 We are six months into our Rotary year and so much has happened since our last visit. We are having our Polio Plus Fundraising project “Ride So They Can Walk.” It’s still ongoing and together, we can “Make that Difference.” The fight against Polio lives on and we can reach our goal of raising $300K through everyone’s participation. Don’t give up! I ask that you continue to raise the public’s awareness of Polio, the good Rotary does in the world, and continue to Ride So They Can Walk. Another project that is dear to my heart is the Holiday Homelessness Project at Kahauiki Village Transitional Housing on Oahu, where fellow Rotarians in collaboration with other organizations are donating their time, talent and resources by painting and cleaning these housing units. Our goal is to help homeless families get off the street and into a home by the end of the month. We sent a “wish list” via your club president asking for your assistance in supplying 30 of these housing units with needed household products and supplies. Please work with your Club President and/or AG in securing items on the list. This is a manageable act of giving that will make such a big difference for many families this holiday season. As we navigate to the end of the year and approach the holiday season continuing to change lives together, may the Spirit of Christmas be never-ending, filling your home with the warmest greeting for this holiday season. From my home to yours, a very Merry Christmas and Happy Holiday! Happy Thanksgiving everyone! I am so blessed to be a Rotarian and have many friends like you. As we enter into the holiday season, please be safe and share the opportunity of service through Rotary Give Thanks Day. Our Polio Plus “Ride So They Can Walk” Bike ride is ending November 18th and I know we can reach our goal. Many are looking to raise a $100 and stop. I say, don’t stop, continue and add another “0” zero at the end. Ask family and friends to join our team to End Polio Now. I have been hearing about the many different activities clubs are working on to raise awareness of this disease. The Rotary Club of Poipu Beach held a Raise a Glass to End Polio event on October 18th where they donated 100% of the sales from two beer taps at Merriman’s Kauai during the culinary market at the Shops at Kukui’ula to The Rotary Foundation Polio Plus fund. The Rotary Club of Honolulu Sunrise held a casual One Day, One Focus, Ending Polio evening under the stars at Bakery and Table for World Polio Day on October 24th. Palettes for Polio will be hosted by the Rotary Club of Kona Mauka at which 40 artists’ palettes will be painted and offered at a silent auction at the Rumley Gallery at the King Kamehameha Hotel on November 18th. The Rotary Club of Downtown Honolulu held a Strike Out Polio bowling event, while another club is collecting Pennies for Polio. Share your story with our District Polio Plus Chair Charlene Meyers to post on the website. Let her know how you celebrated World Polio Day. You will make crawlers into walkers. You will restore eyesight to those who will never see you. When you donate to do these things, not only will you be IN the Rotary Family, but you will have the Rotary Family in you. Having just completed 47 club visits in the District, I can’t believe we are already 3 months into the Rotary year. Mahalo for your hospitality, accommodations and for chauffeuring me around the state. Three (3) more club visits to go and we are done. I have learned so much from you. I hope you found our visits profitable, meaningful and of value. October is designated as Economic and Community Development Month featuring one of Rotary International’s 6 Areas of Focus, The Rotary Foundation (TRF). 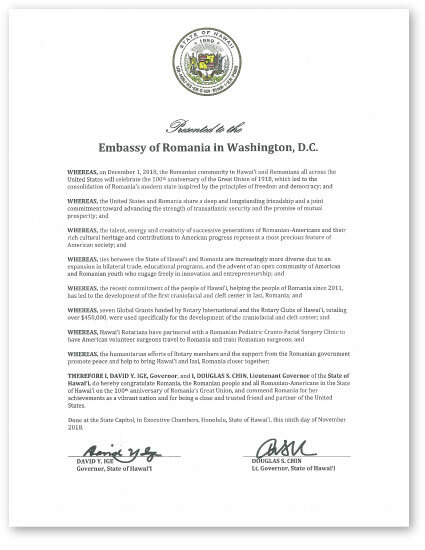 I’ve asked Rotarians from our District to contribute to this topic. 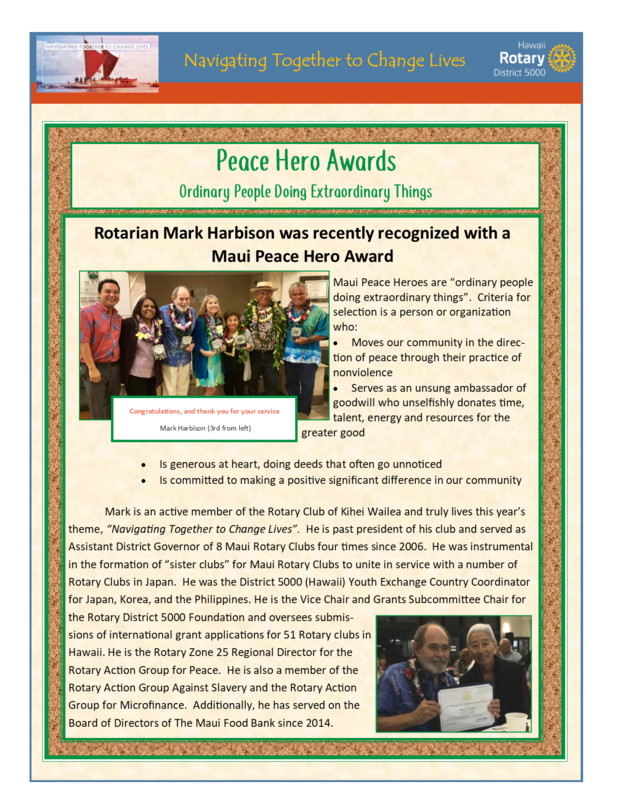 The first is submitted by Geoff Horvath, Past President of the Rotary Club of Wahiawa-Waialua that spotlights one of Rotary’s vital causes -- growing local economies. According to the United Nations, 836 million people still live in extreme poverty. Unemployment and underemployment, along with a lack of economic services, lie at the core of poverty. In addition, nearly 1.4 billion employed people live on less than $1.25 a day. Rotarians promote economic and community development and reduce poverty in underserved communities through training, well-paying jobs, and access to financial management institutions. Projects range from providing people with equipment to vocational training. Our members work to strengthen local entrepreneurs and community leaders, particularly women, in impoverished communities. What are we doing in D5000? 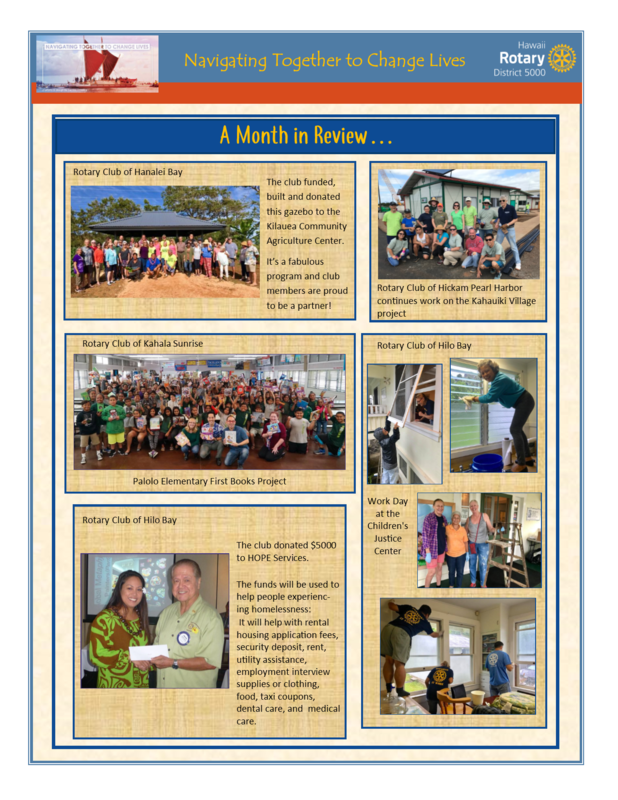 I hope you have enjoyed the first issue of Mauka to Makai, our District 5000 Community Service Newsletter that highlights community service projects our clubs are engaged in across our islands. 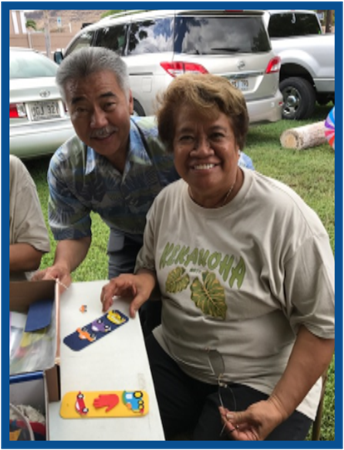 Mahalo to Wally Wong, Community Service Director of the Rotary Club of Hilo and D5000 Community Service Chair, for putting together this culturally based community service program. 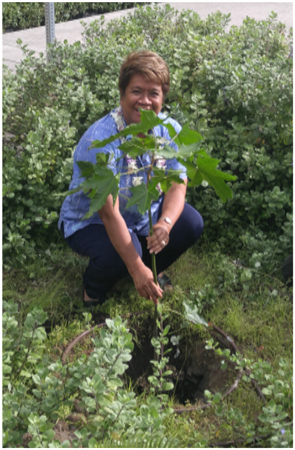 One of the projects featured this month is from the Rotary Club of Hilo in which Rotarians helped plant 28 ulu trees to provide an economic development start for an education and applied research based farm that will provide cultural programs and a sustainable crop. It’s an ongoing project in collaboration with UH Hilo and a grant thru Kamehameha Schools that supports the lease of 15 acres of land with the purpose of propagating Ulu. Kaivao Farm, an agro-forest farm, specializes in the cultivation and production of two food crops: breadfruit (ulu) and cassava, and two art crops: wauke (paper mulberry) and hala (pandanus). Breadfruit and cassava produce high yields of organic starch to supply local markets, restaurants, and a feed mill in Panaewa, while wauke bark and hala leaves support the art-forms of kapa making and weaving. Kaivao Farm presents an opportune venue for education and research surrounding the practices and resources of the farm. 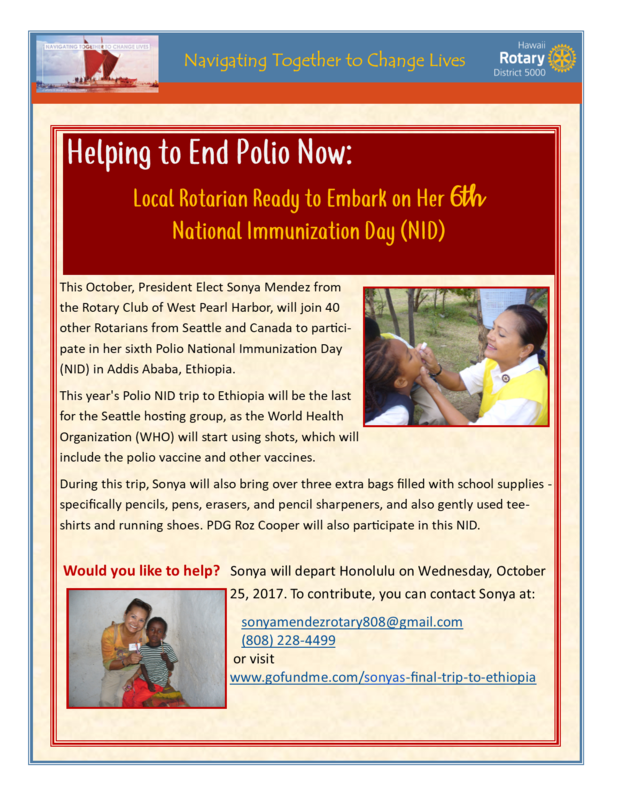 From the Rotary Club of Pearl Harbor, President Bruce Fink reminds us that October 24th is World Polio Day and brings our attention to the article, Our Goal: A World Without Polio, recently featured in The Rotarian. To reach this goal, the Rotary Club of Pearlridge, led by President Lasar McCabe, sponsored a BBQ fundraiser dinner with all proceeds going to Polio Plus. A second initiative is the “Ride So They Can Walk – Polio Plus fundraiser” in which members who donate a minimum of $100 to Polio Plus before October 24 will receive a calendar. Q: What is one of the goals for our new R.I. President, Ian Riseley?